Green Party members have voted by over 86% to go into Government with Fianna Fáil. Of the 510 members who voted, 441 voted to accept the deal after studying the draft programme for government. 67 voted against and there were two spoiled votes. 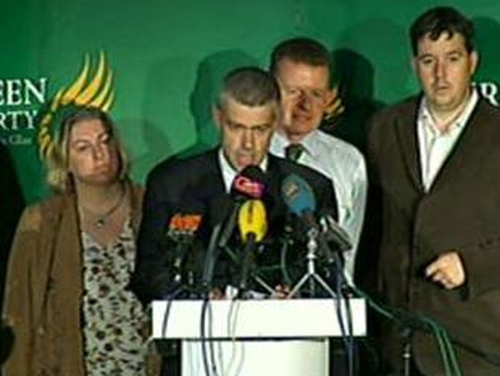 Trevor Sargent has resigned as leader of the party following tonight's vote. Mr Sargent, who had strongly supported entering government, said this was the proudest day of his life and said courage had won out over caution. He said he would serve as acting leader until a replacement is elected and that in a spirit of partnership he would second the nomination of Bertie Ahern as Taoiseach tomorrow. He said he would not accept a cabinet position in the incoming government but would be prepared to act as a junior minister if a position was offered. He also said the Green Party would continue to work on behalf of the people of Iraq and of those who wish to reroute the M3 Motorway away from the Tara Valley. The Fianna Fáil parliamentary party has also given its approval to the deal. Following a meeting with the parliamentary party this afternoon, Fianna Fáil's Deputy Leader, Brian Cowen, told reporters that there had been unanimous backing from the meeting for the deal. Speaking on RTÉ's Six One news this evening, Mr Cowen confirmed that the proposed coalition deal included the Progressive Democrats. Asked if the deal included the PDs in government, specifically Mary Harney at the cabinet table, Mr Cowen replied, 'yes'. The Taoiseach's objective, he said, from the outset was to provide a broad-based coalition that would have the support of the three parties and Independents. Meanwhile, Independent TDs, Finian McGrath and Michael Lowry have both confirmed they will vote for Bertie Ahern as Taoiseach when the Dáil meets tomorrow. Independent TD Jackie Healy-Rae has also concluded a deal with Mr Ahern. Read the full draft programme here or see David McCullagh's analysis of its provisions.